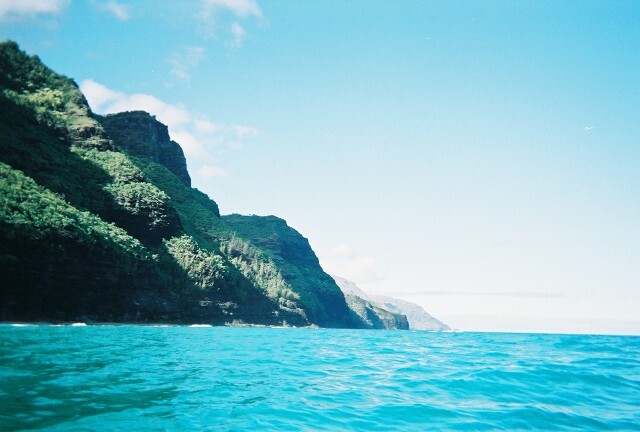 I kayaked the entire Na Pali Coast – 18 miles of rough open ocean with no “bail out” spots. 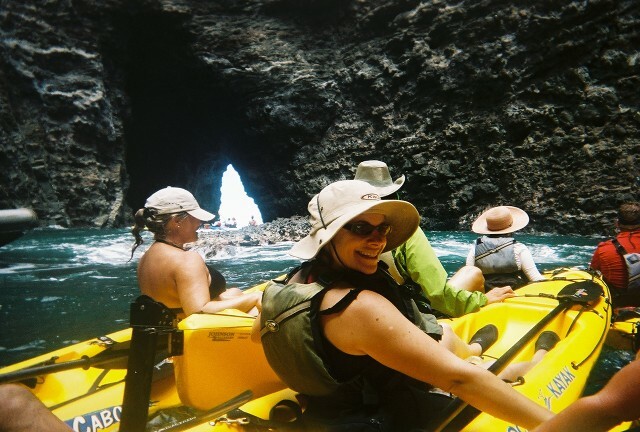 After rafting the Colorado river, National Geographic ranked kayaking the NaPali the #2 adventure in America. And I did it. And I survived, rather, I thrived, with flying colors. Now – I am not an adrenaline junkie. I hate “adventure sports” for their own sake. You will never find me attached to a bungee or a parachute. Hiking is cool, even difficult hiking, but I won’t ever veer from the path. So why oh why did I sign up for what seemed like a suicide mission? I’m not quite sure. It’s not like anyone helped me out psychologically there — everyone I spoke to said it was really difficult, an event that would push you to the limit, and one woman even compared it to childbirth. So why, again, would I do this? I kayaked from the end of the north road to the end of the south road. Yes, that's about a third of the entire island. Stress. Life. Powerlessness. Who knows. The feeling that I was not actually relaxing and having a vacation (see previous post), combined with somehow wanting to prove something to myself – prove…what? Prove…I don’t know…that I’m not a weakling, that I can deal with life, control my body, tackle seemingly huge and scary tasks…all of that. And kayaking in the ocean takes all of that. You cannot think or worry or stress out about anything else because you have to be right there and only there. In fact, if your mind wanders, you can flip your kayak or crash into cliffs or both. Of course, being on one of the most beautiful, unique islands in the world helps — nobody can see this beautiful coastline in its entirety — except on a kayak. Even a motorboat isn’t enough – they cannot enter the caves and nooks and crannies or land on the tiny beaches that are only accessible to small small boats like kayaks. I wish I could report that I was scared. Before or after. Or during. But I wasn’t. I think beforehand I had resigned myself to the “fate” of it all — it would be hard or easy or somewhere in between…I would survive fine or I wouldn’t and it would be a disaster. Whatever, it would be what it would be and there was no point in worrying about it. What I didn’t expect was that it would be as fun and smooth and effortless as it was. Well, not effortless – the paddling was brutal – but I didn’t tire out in the first hour like I thought I would. In fact, I was among the best. I was paired with another single woman (what they were thinking, I don’t know – the guide could have taken one of us, and there was a single guy, too — even out the men/women ratio — but no). We had the most solid consistent rhythmic stroke of anyone. We NEVER flipped over. One friendly couple, who wasn’t even fighting, flipped over 7 times! We almost always led the pack – next to the lead guide. Crazy. Every other kayak had a strong man in it, strong men with decent upper body strength — I was shocked myself at how good we were doing — I had expected to be the trailing kayak who needed help flipping over every few minutes. In any case – I have never felt my body so entirely. It was like a full day’s meditation. 18 miles is no small feat – whether you’re walking or running or swimming or whatever. My arms did a lot of that work. The ocean, the cliffs, the caves, the sky, all so beautiful. We also saw a group of small dolphins close up (I believe they were called bottle dolphins). And talk about beating the stress out of yourself physically — there is nothing like such an intense challenge to shove all of the “everyday life” out of you. Perspective. I’ll be remembering this for a long, long time. 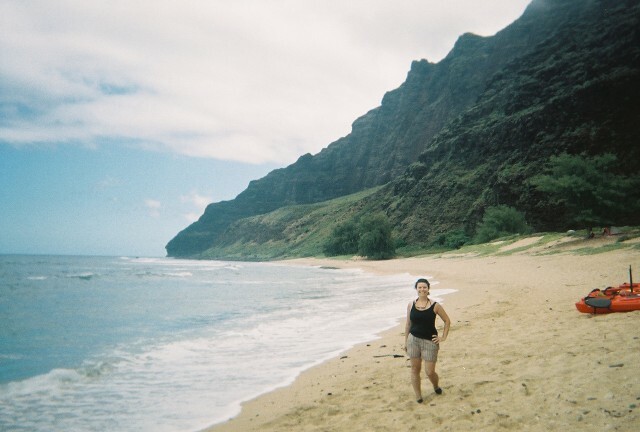 All in all – if you’re even on Kauai and you’re not a 90 pound weakling, I would highly recommend kayaking the coast. You can only do this in the summer, though, and I wouldn’t recommend it to people with bad motion sickness issues (I usually do, but I took some new pills the night before and morning of, and had no trouble – the ginger I took with me also helped). That said, this isn’t an airplane or a sheer drop into a valley. People have been traveling the world in small vessels since prehistoric times. It’s how we got to where we got. Ancient Hawaiians lived on these remote cliffs and valleys. It’s only natural we see these places in the way they would have. The kayak company I chose was Kayak Kauai — nicer more professional folks I’ve not met in ages. The Na Pali National Park website — for permits on camping and hiking, as well as kayaking info. We are very proud of you Irene.